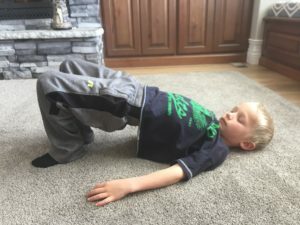 Looking for core building exercises you can do in the comfort of your own home? I recently had a friend text me and shared her frustrations about having a “non-existent core” from having babies. Yes she used those exact words! How many of you feel this way? Seriously! I remember when a simple sit up was a struggle. My husband would fill my stomach and say, “FLEX…” as I would laugh through my tears and say “I am flexing! 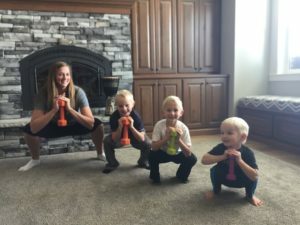 !” My friend then asked if I had some ideas on ways to strengthen the core while at home. I know what its like. Its hard to leave your little ones to go workout.When your pregnant your exhausted, sore, big etc. When your nursing you are still exhausted, hungry all the time from nursing, and its hard to leave your baby. You are up a lot at night caring for your sweet babies, making waking up early to workout a difficult feat! Let me put this in perspective a little to show you what rock stars mamas are!! I have had 5 boys and 1 miscarriage which equates to 48 months of pregnancy. That is 4 YEARS BEING PREGNANT PEOPLE!!! I also nursed my boys on average about 6 strong months, making that another 30 months. This is another 2 1/2 years of my body not being my own, making it a total of 6 1/2 YEARS! That is half of my marriage! 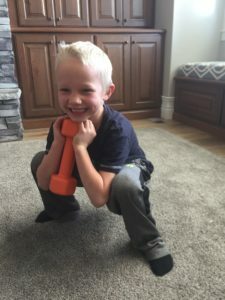 My point in all of this perspectiveness (I’m sure that is a word) is that during this time when your body is a life line for a little human, you need to keep that body strong. Don’t wait until your done having kids. If you can’t go to the gym, find a way to do it at home. I don’t believe in doing things that are a waste of time! This is my favorite thing he said! He believes in doing workouts that carry over into real life! The trick with doing them at home is finding ways to add intensity as your body gets stronger. You can do this by adding weights (here is a set you can buy with a stand). You can get them cheaper at Walmart if you buy them separately without the stand), doing more reps, or taking less rest time between each exercise. Here is a list of 5 different core exercises that he recommends. You can do a circuit of 10-15 reps of each move, and then rest in between for 30-60 seconds. He recommends doing a goblet squat. When you do a goblet squat you are using your core to keep your chest up while allowing your body to squat. Hold a weight close to your chest and with your weight back on your hills, lower your body into a squat while keeping your back straight. To achieve a goblet squat, go down until your elbows are touching the inside of your knees. Holding a weight will force you to use your core. This is exactly how it sounds. Simply squat down into a squat and come out of the squat and jump straight up. When you add a jump, your core will help you jump and then engage when you land. You can mix this exercise up. There are various different ways to hold a plank. You can visit this article for 20 different ways to do a plank. Push-ups are a lot like planks but you are “actually doing something useful” (yes he really did say that). Push-ups help strengthen your core as well as your upper body. 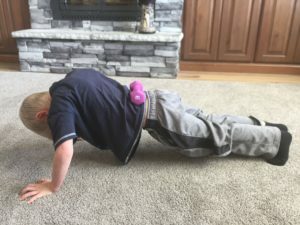 My son wanted to add weight to his push-ups. He thinks he is pretty tough. Keep your core firm and strong. Lay on your back on the floor while simply lifting up your hips. Extend your hips all the way up . To make it more challenging you can add weight on top of your hips. Don’t touch the floor as you are coming down. 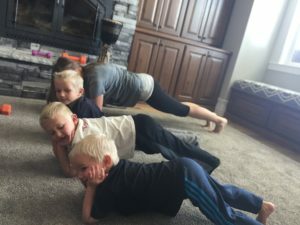 In a blog post I wrote a couple months ago called, The 1 Thing I Would Change After 6 Pregnancies, I talked about the importance of keeping your core strong especially during your baby bearing years!! Carrying a baby for 9 months is no small thing you are asking your body to do. Your body was made to carry babies, but it is up to you to keep your body strong. Another post that may interest you is 1 Sure Way to Start and Not Stop Your Exercise Routine.